Here you will find our press releases and technical articles including photographs. If you are looking for material for an article on testing and measurement technology, please contact our press contact person. It’s only been a few months since the launch of their new, fully-automatic cable test van, “titron”, and BAUR GmbH is already expanding its range of equipment. The objective of the new functions is to provide quick cable diagnostics as well as improved and non-destructive location of cable faults. In addition - just as with the entire titron device - the focus was on easy and intuitive operation. Mains operator MDN Main-Donau Netzgesellschaft mbH, Nuremberg, the Faculty of Electrical Energy Systems of the Friedrich-Alexander-University Erlangen-Nürnberg and BAUR GmbH have signed a cooperation agreement to develop a measurement system for the dielectric diagnostic testing of 20 kV medium-voltage cables for condition assessment purposes. “Lightweight, compact, powerful and easy to han-dle” were the criteria when the engineering team of BAUR Prüf- und Messtechnik GmbH were developing the new device - PD-TaD60 - for partial discharge measurement and location. 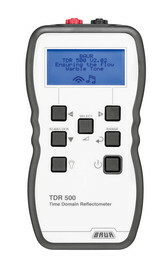 With the handheld devices TDR 500 and TDR 510, BAUR Prüf- und Messtechnik GmbH presents new and robust time domain reflectometers for length determination and fault location in power and data cables. With the hand-held unit “paula” and associated accessories, BAUR Prüf- und Messtechnik GmbH presents an easily manageable, battery-operated set to detect phases on medium- and high-voltage cables. With the “titron”, BAUR Prüf- und Messtechnik GmbH presents a new, automatic cable test van. Its modern equipment and innovative operational concept make fault location on one- to three-phase cable easier. With the PD-SGS, BAUR Prüf- und Messtechnik GmbH presents a handheld device for the quick initial detection of partial discharges in switchgear and cable accessories. The device offers two safe procedures for detecting partial discharges that can be applied during operation – live – without attaching sensors to the cable. Evaluating the condition of cable systems helps medium-voltage network operators with efficient network planning and maintenance. Cable diagnostics can be made cost-efficient and easy to integrate into day-to-day operations by deploying measurement technology that uses a VLF sine voltage source (Very Low Frequency). 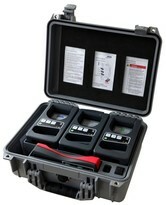 This source can be used for cable testing and diagnostics. It weighs less and delivers reliable results.